My former chavrusa who is learning in the Holy Land now called me two weeks ago to tell me that it’s been released there already. My dad picked up two copies last week while he was there and sent them to me; they should arrive tomorrow or Thursday. 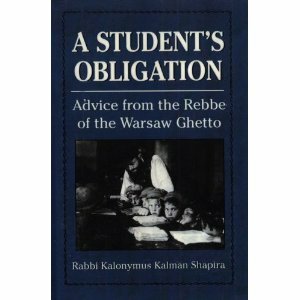 One copy is going to my Yeshiva, where my well worn copy of A Student’s Obligation is changing hands, and one is going on my own bookcase. When I called Feldheim two weeks ago, they were very hush-hush about who translated it. 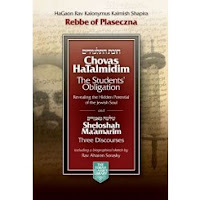 However, based on the fact that they are promoting that R Aharon Soransky wrote the bio, I believe it’s the same translation. 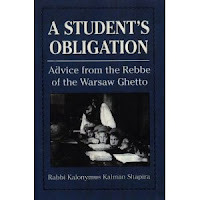 Niggling little point: the cover of the Aronson version says “Advice from the Rebbe of the Warsaw Ghetto” but the book was published in 1932. There was no ghetto in 1932? Anyway, it’s nice to see Feldheim back at what they’re good at: giving up decent translations of the classics instead of “interpretive” versions like their competition.